More and more channels that used to be only on cable are now becoming available for a lot less through the Internet streaming services I describe below. You can watch most of these on your computer with an Internet connection, or on your TV connected to a game box, smart DVD player, or streaming player like Roku, Chromecast, Amazon Fire TV, or Apple TV. Some streaming services have a subscription model, while others let you purchase or rent individual movies or shows. Some stream live TV while others let you choose from a library to view any time you want. These companies offer live TV in real time, just like cable and broadcast TV, except that it’s streamed over the Internet. The number of companies offering these services has really exploded after Sling TV opened the floodgates. Services like these might be the nail in the coffin for traditional cable TV, because they offer a lot of the popular channels for a fraction of the cost. To watch these services, you need an Internet connection. You can watch them on a computer, tablet, or phone or on your TV if you have a streaming device like a Roku, Amazon Fire, Apple TV, or Chromecast. Sling TV was the first viable online streaming service that offered previously cable-only channels like ESPN. However, Sling TV does not offer the major networks like ABC, CBS, and NBC. If you can get those channels using an antenna though, Sling TV might be a perfect low-cost solution. Click the box below or this link for more information. You can get both for $40/month. Overall, Sling TV is a good deal and many cord-cutters use it. Sony Playstation Vue is an online video streaming service which offers the major networks (unlike Sling TV) plus more cable channels starting at $45/month, and up to $80/month for their top “Ultra” plan. And no, you don’t need to have a Sony Playstation. You can watch Vue on other streaming devices. Their lower-cost plans offer a subset of these channels. See their site for details. YouTube TV offers live streaming TV of the major networks plus some cable channels like AMC, along with DVR capabilities. The cost has increased to $49.99/month but they’ve added Discovery, HGTV, Travel Channel, and a couple other popular channels. There is a one-month free trial. YouTube TV is not available in all markets. But, if you want the major networks plus cable channels, and it’s available in your city, YouTube TV is worth looking at. Hulu with Live TV is just just what it sounds like – the Hulu service plus a selection of over 50 channels including the major networks and cable channels streaming in real time, similar to YouTube TV. Also like You Tube TV, it’s available in “select markets”, which probably means major cities but not rural areas. Cost is $39.99 per month. Not only do you get live TV, but you also get Hulu’s inventory of streaming TV shows (like “The Handmaid’s Tale”) and movies. This is a pretty good deal. A new streaming TV service has arrived called Philo TV. The difference between Philo and all of the other services is that it offers no sports channels. Since sports channels cost disproportionately more than other channels, this can save a lot of money if you are not into sports! Cost is $16 per month for the 40-channel package and $20 per month for the 49-channel package. See channels below. If you don’t need sports channels, Philo might be a good choice for you! You can watch CBS shows live and on-demand with CBS All Access for $5.99/month with limited commercials or $9.99/month for no commercials. This could be useful if you can’t get free broadcast TV, and love the Big Bang Theory like me. But on the other hand, many top shows like Big Bang Theory are available of the CBS website for free for a limited time the day after as well. Fubo TV originally started out in 2015 as a streaming service specializing in soccer channels but they’ve added more mainstream channels to make it a legit all-around streaming service. They’re still heavy on sports with the glaring exception of ESPN. Also note that their introductory $39.99 price goes up to $44.99 per month after one month. Compare the channels they offer and their price with the other services on this page to determine if it’s a good deal for you or not. DirecTV Now offers local channels plus some cable and movie channels. It has recently caused a big stir in the industry by reducing the number of channels it offers, raising prices,, and making HBO and Cinemax mandatory whether you want them or not. Depending on exactly which channels you want, it might still be worth looking into though. They have two plans: Plus and Max. Their $50/month Plus plan is intended for those who don’t watch sports, while the Max plan at $70/month has ESPN and other sports channels. Both plans are missing popular cable channels like A&E, Discovery, AMC, Lifetime, and Comedy Central, so beware. With so many choices, which one is the best? Well, the decision partly depends on which channels you want to get. But I would say, if you are able to get the major network stations (ABC, CBS, etc.) using an antenna, I would go with Sling TV because it’s the cheapest, although it has a somewhat minimalist set of channels. If you are not able to get the networks using an antenna, I would go to YouTube TV or Hulu with Live TV, depending on whether you want to pay a little extra for Hulu’s regular offerings in addition to the live TV. Note, cnet.com has created a handy chart showing what channel each of these services offer if you are looking for a particular channel. These are not live-streaming services like cable or broadcast TV. Rather, these have libraries of videos that you can watch any time. Netflix offers a good selection of movies, TV shows, and original content like “Tidying Up with Marie Kondo”. Unlimited streamed programming starts at $8.99 per month for SD quality and $12.99 for HD on two screens at the same time, going up to $15.99 for Ultra HD and four screens at the same time. Netflix works on a wide variety of devices including your computer, Roku, and Apple TV, as well as the PS3, Wii, and XBox game consoles. Some DVD players and TVs can also stream Netflix. You can try it free for a month to see if it’s right for you! 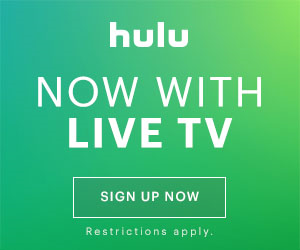 Hulu (the regular non-live TV version) is a subscription plan featuring a catalog of TV shows and some movies for $7.99 per month with limited commercials and $11.99 per month with no commercials. Hulu does have some movies, but the selection is not as large as Netflix’s. Many of the TV shows are on free broadcast TV, but if you don’t have reception, or if you like to watch these shows at any time of your choosing, Hulu could be good for you. They also have some originals like “The Handmade’s Tale” (which I personally enjoyed). They have a one-month free trial so there’s nothing to lose to try it. Hulu’s free TV show offerings have been moved to Yahoo View. SHOWTIME for Roku and other streaming boxes is $11 per month, also a great deal if you are into movies! They have a seven-day free trial. Amazon Prime is a subscription service that is well worth mentioning. For $12.99/month, you get access to thousands of movies and TV shows on Amazon. Now, these are going to be some of the older movies and shows, but the selection is not bad. As a bonus, you get free two-day shipping when you buy stuff on Amazon, as well as other benefits on Amazon. It’s not a bad deal if you use what it has to offer. Many people I know swear by this service. And good news for Apple fans, Amazon Prime is coming to Apple TV. HBO Now offers the movies and original programming of HBO, but all you need is an Internet connection! No cable TV subscription required! You can watch HBO Now on your computer, Amazon Fire TV, Apple TV, Chromecast, iOS device, or Android device. It’s currently $14.99 per month. If you just gotta have “Game of Thrones”, now you can have it without cable! Amazon Video offers tons movies and TV shows – a great selection, that you buy or rent individually as opposed to a subscription. Movies range from 99 cents to $4.99 to rent. You can also purchase movies and TV shows. I personally use Amazon Video and like the convenience of being able to watch content on my iPad or Roku or computer. Click the box for more information. For more info on Amazon Video, check out my review of it on my blog. Fandango Now is a video service offering recent movie and TV show purchase or rental, similar to Amazon Instant video. Prices are comparable to Amazon. If you own an Apple device, you know about iTunes. TV shows are $2.99 to buy and movies are $4.99 to rent. This is about a dollar more than other services like Amazon. Selection of recent movies and shows is pretty good. You can watch them using your Apple TV, iPad, iPhone, or computer. I personally watch a lot of video content on YouTube. It’s a great source of free older TV shows, concerts, comedy shows, and other content. For example, I was able to watch a good number of some older full episodes from the Discovery Channel just by searching YouTube. All of the episodes of the vintage sci fi series, “Space:1999” is on YouTube. You never know what you will find. You can watch it on your TV using Apple TV, most modern Roku devices, Chromecast, or Amazon Fire TV. For more hints on what to find on YouTube, check out this article. I highly recommend YouTube as a source for totally free video! Pluto TV is a free streaming TV and movie service that offers both on-demand movies and a live-TV-like viewing experience. You can watch on their website or on a your streaming device. The movies are older, of course, but they’re better quality than what many other free streaming services offer, in my opinion. Let’s not forget full episodes available free on the major network websites. Be careful to distinguish between “full episodes” and “clips”. Also, more and more sites are requiring “cable TV login”, which means you have to have cable TV to view some of the shows unfortunately. But, there are still a good number of current shows availble for free on the networks’ sites (I usually watch the Big Bang Theory that way). You can find links to free video on the ABC, CBS, NBC, Fox, CW, PBS and much more at my Free Internet Video Links page. Sony Crackle is a source for free (and legal) Hollywood movies and TV shows. The selection is mostly older stuff, more more modern B and C-level stuff, but there are some gems in there. You can watch on your computer from the website, or on your TV; all of the major set-top boxes have a Crackle app built-in. Check it out! Similar to Sony Crackle, Popcorn Flix offers older movies for free, both on their website and in their Roku app (also available on other platforms). Roku is getting into the media business with The Roku Channel, offering free older movies and TV shows, but on their website and Roku app. Vudu, formerly a video-rental-only service, now offers a selection of free movies! Navigate to the “Movies on Us” section to find a bunch of movies that are “free with ads”. Okay, these aren’t recent releases, but you might be able to find an oldie that you like, and there seems to be a better selection than the other free movie sites. When Hulu discontinued their free shows, Yahoo acquired them and renamed the service Yahoo View. You can find some good TV shows here. They do have some movies, but the selection is pretty bad.